Mr Turner was written and directed by the acclaimed Mike Leigh and chronicles the last twenty-five years of one of the most celebrated artists in British history – J.M.W. Turner. 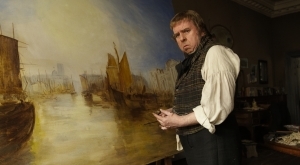 The biographical drama takes us back to the nineteenth century when Turner travelled and painted some of his renowned works, even though he was struggling with the death of his esteemed father. The film also highlights Turner’s eccentric behaviour which resulted in his being both celebrated and reviled by the public and royalty alike. 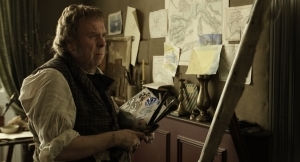 Turner is played by BAFTA winner Timothy Spall (Harry Potter and the Goblet of Fire, The King’s Speech) and also stars Paul Jesson (Vera Drake, Rome), Dorothy Atkinson (Call the Midwife, All or Nothing), Marion Bailey (Persuasion, Meantime), Karl Johnson (The Illusionist, Hot Fuzz), Ruth Sheen (Run Fatboy Run, Vanity Fair) and Lesley Manville (Maleficent, Another Year). The Mr Turner production visited The Historic Dockyard in Chatham where they used HMS Gannet which doubled for a pleasure vessel on the Thames as well as the scenes where Turner is tied to the mast of a ship in a storm to make some sketches for his painting Snow Storm- Steam-Boat off a Harbour’s Mouth. Stangate Creek was also used to film a rowing scene. Turner had a rich history with Kent and drew inspiration for his works from a variety of locations including Stangate Creek, Margate and Whitstable. Now, the Turner Contemporary gallery in Margate celebrates Turner’s association with the area. The Historic Dockyard Chatham lies on the River Medway which boasts a dry dock, cobbled streets, industrial buildings and extraordinary Georgian and Victorian architecture. The location has previously featured on screen in productions such as Muppets Most Wanted (2014), Call The Midwife (2012-2014) and Sherlock Holmes (2009). Stangate Creek is on the River Medway and has been used by feature film adaption Great Expectations (2012) as well as the BBC’s Great Expectations (1999). Mr Turner is released in cinemas on Friday 31st October 2014. This entry was posted in Filmed in Kent and tagged feature film, Mike Leigh, Mr Turner film locations, Paul Jesson, Stangate Creek, The Historic Dockyard Chatham, Timothy Spall. Bookmark the permalink.